The map purports to show an accurate breakdown of who controls what in Syria at the present time. But while broadly in accordance with the reality on the ground it contains at least one important error, which deserves to be pointed out, since adherence to the faulty map could have potentially disastrous consequences for visitors to Syria. I’m concerned here with the part of the map dealing with Kurdish majority north-east Syria. I just returned from a reporting trip there, where I became aware of the map’s faults in a fairly practical way. As you can see, the map depicts north-east Syria as controlled by ‘pro-Kurdish’ forces, which the map uses the color yellow to denote. The map accurately notes that the city of al-Hasakeh is controlled by the Assad regime’s army, whose color in the map is orange. From there, however, the troubles begin. As observers will note, the map has the city of Qamishly colored in black. This is the only city in Syria colored in this way, and the map’s key does not explain what this coloring denotes. The map also has the area around Qamishly, and indeed the entirety of north-east Syria colored in yellow, indicating an uncomplicated reality of dominance by Kurdish forces. This is an inaccurate depiction. In fact, Qamishly city and a considerable radius around it is in the hands of Assad’s army, as I discovered a couple of weeks ago when trying to reach Sere Kaniyeh from the town of Derik/Malkiyeh. Making this journey was essential for my reporting purposes, and its requires going through Qamishly. Because I consulted sources other than the UNCHA map, I was aware that Qamishly was in regime hands. Still, I wasn’t prepared for the depth and extent of regime control. Qamishly city is filed with regime police, soldiers, flags, and a number of checkpoints. I was travelling with a very experienced local Kurdish driver, and his wife, a translator. Because of this man’s local knowledge, we were able to avoid the checkpoints. As we drove west, the signs of regime dominance were still apparent, even 10 and 15 km outside the city. Regime flags, pictures of Bashar Assad, Ba’ath party banners. The basic failure of the Relief Web map to conform with reality did not lead to any great consequences in my own case. That was due to the skills and knowledge of my hosts, and to my consulting of other sources. It is nevertheless, a notable professional failure. The UN Office for the Coordination of Humanitarian Affairs has an overall global budget for 2012 of $285.4 million, according to its website. Possession of this sum, sadly, did not enable it to come up with a simple map outlining the division of forces in northern Syria which managed to approximate the actual situation. This is unfortunate. 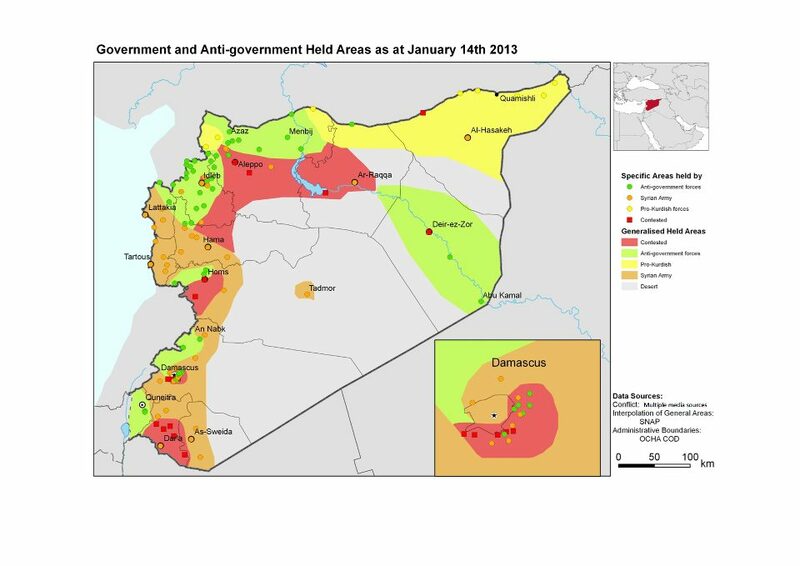 I write this article to caution journalists and others planning on working in Syria, and researchers and observers of the situation in that country against relying on the information provided in the Relief Web map of ‘Government and anti-Government Held areas’ of Syria, as published in January, 2013. This entry was posted in Uncategorized and tagged map, Syria. Bookmark the permalink. Thanks Jonathan. My wife and I had been considering a summer vacation in Qamishly, but given the uncertainties there, we’ll probably settle for Lyme Regis instead. An excellent decision, I feel…. Jonathan, in your opinion are the Russian, Iranian and Iraqi governments supporting the Assad government in Syria? Yes, without any doubt. And their support is a vital element in Assad’s ability to keep going. What sort of support is it?